The Sicilian Coat of Arms Sicily design is a perfect for anyone from Italy or anyone going to Italy. Awesome tourist, vacation and holiday hoodie for those that love the history of Sicily. 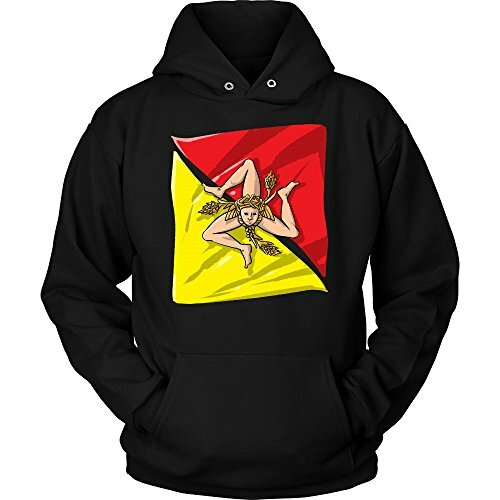 Feel like a king or a queen with this royal arms graphic Italian hoodie! Beautiful and original design - All products made in the USA. Novelty Italia gift hoodie for your mom, dad, girlfriend, boyfriend, sister, brother, husband, wife, daughter, son or Italian friend! Love Italy and everything about Italy and wear yours now. If you have any questions about this product by Italian, Italy, Sicily hoodie, contact us by completing and submitting the form below. If you are looking for a specif part number, please include it with your message.